My lovely friend Naomi flew up to Auckland last weekend (while I was reconciling the Yacht Club’s bank statement…!) 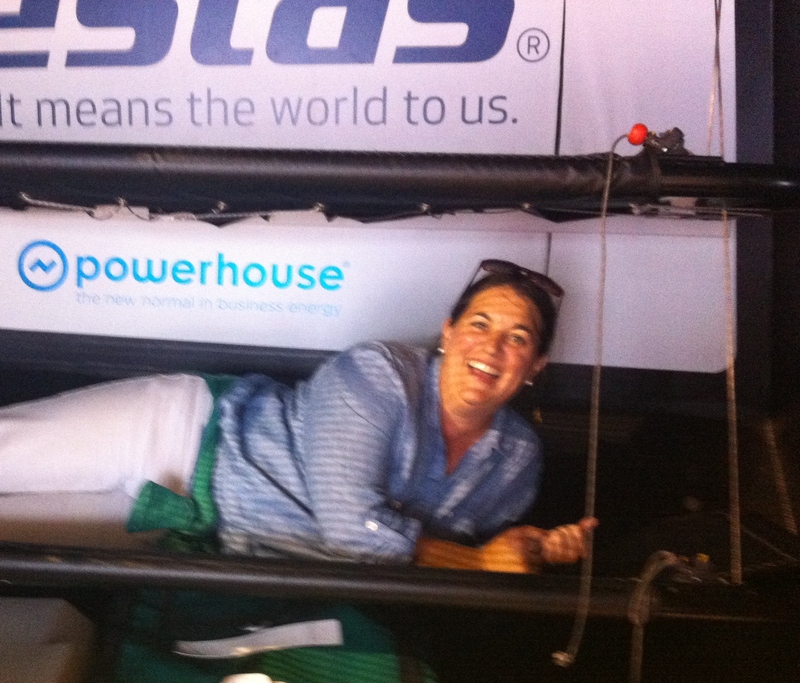 and she went to see the Volvo Ocean Racing yachts. I was super jealous that I wasn’t going as well! Naomi is a brilliant writer and she agreed to write a guest post on the blog about her adventures. I hope you enjoy! Question: Why would a girl catch a plane and travel to the other end of the country to visit some boats? Answer: Because she’s been reading/watching/following the Volvo Ocean Race and checking the app on her phone each day, and she’s addicted! My interest in the Volvo Ocean Race became a serious habit following a delivery trip when we learnt that Team Vestas had hit a reef. It was mindboggling to be on the water, away from land and trying to imagine everything the Vestas crew must have be going through. When we finished our trip after a mere 27 hours, and were tired and craving a shower and a real meal, I kept thinking of the Volvo crews who do this crazy exhausting sailing business for over three weeks at a time. Not only that, they stop, shower, eat, have a beer, catch up with family and then do it all over again. And it’s not just a boys’ game, the girls are doing it too! I decided to go to Auckland to see the boats and the craziness for myself. When you live in Christchurch (city of Rock and Roll – big earthquakes four years ago) Auckland seems like a trip overseas. Shop verandahs, city scape, tall buildings, lots of boats and a thriving, buzzing marina. The Volvo Village feels like a party, its free to the public, everyone has come for a day out and there is a lot to see … from mega yachts to Optimists. I met Mr Richard Wingfield, Chairman of the Auckland Stopover Committee in the Heineken Bar – Heineken are NZ sponsors along with Stoneleigh Wine, Sky City, and NZ Herald Media Group. 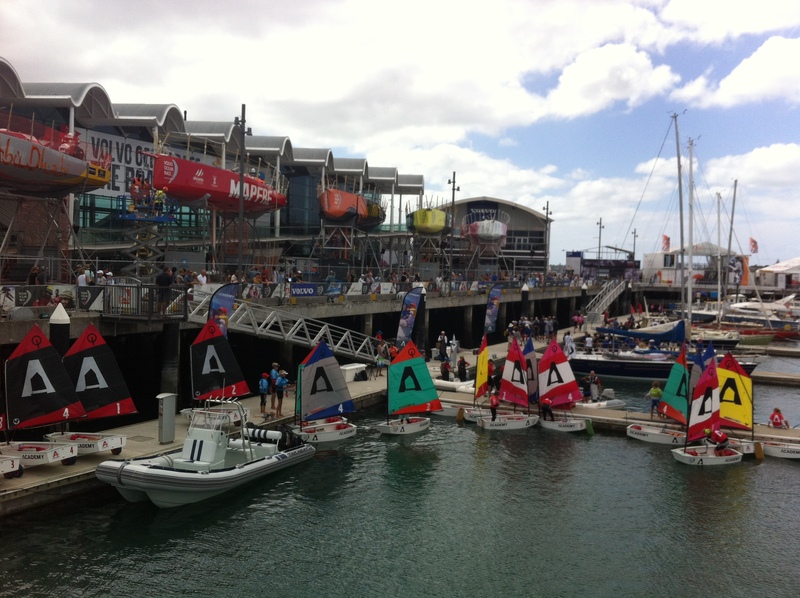 The Volvo Ocean Race Auckland stopover costs millions but only a small proportion is from government funding. The bulk of the funding is from corporate sponsorship and the Auckland stopover will return a profit. There were approximately 100,000 visitors to the Volvo Village in the first four days, most of them buying food, and drink and merchandise. And there are benefits to the Auckland and NZ economy too – The sailors travel and holiday while here and one Auckland hotel alone has 1358 room nights booked by Volvo Ocean Racing crew and families. From the Heineken Bar you can see straight out to the harbour where the In Port races will start and finish. Richard pointed out the Members’ Lounge – a fantastic spot at the marina entrance. It would have been the Team Vestas site, but don’t worry they’re re-joining the teams at the Lisbon stopover. Richard very generously took me on a tour, starting with the Head Quarters for the Auckland Stopover. 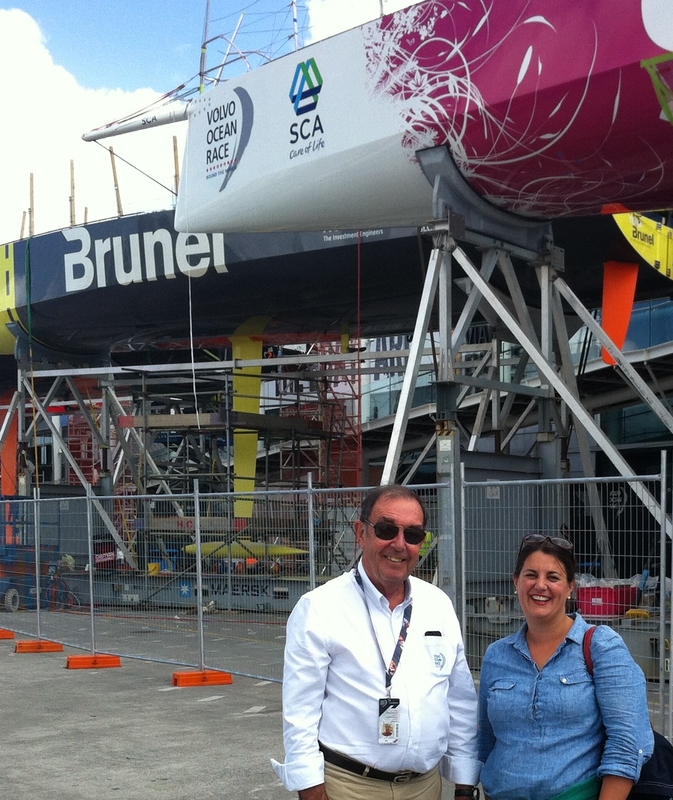 The Volvo Ocean Race support and onshore set up is one huge sponsored juggernaut of logistics and organised frenzy. 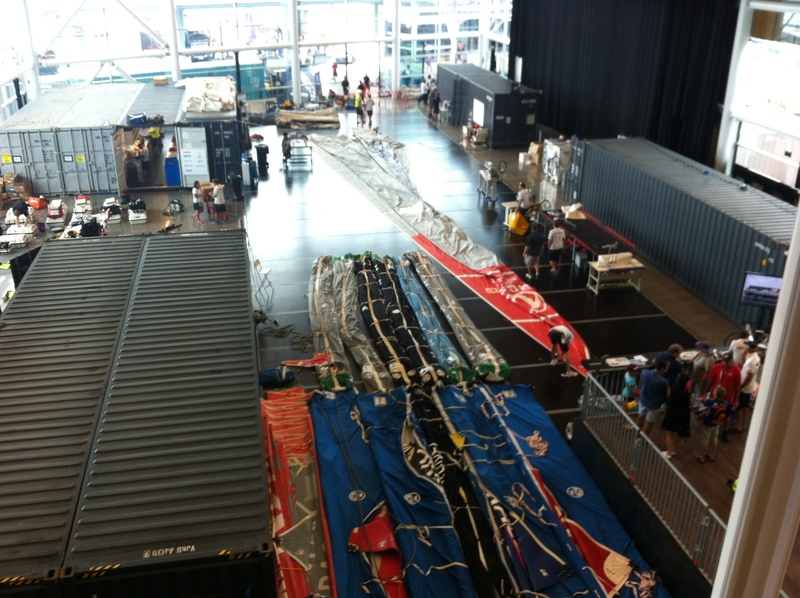 The whole of the Convention Centre building is taken up with Volvo Ocean Racing – from the media centre to the sail loft and maintenance, and it is base camp for the 470 Auckland volunteers who are helping. As we saw on http://www.volvooceanracing.com a series of shipping containers are set up as portable workshops which are used by the 64 crew who travel around the world maintaining the boats. In order for all the gear and equipment to be ready on site at each stopover when the boats arrive, there is pretty much two of everything being shipped around the world – including the massive Volvo Display showroom which can constructed in seven days. While one Volvo Village is being broken down the next one is being set up. The merits of One Design race competition is well debated. But after watching the yachts arrive into Auckland I better understand the excitement. Each boat has the same specs, the same sails, even the same ropes. That means the difference is in the sailing not the design. As Richard says ‘it’s a game of skill.’ And in Auckland ‘the finish line delta was roughly five minutes between the first and third boats’. After sailing 5,000 nautical miles that’s pretty exciting! It’s strange, the yachts themselves don’t actually look that big when they’re on the hard – but they are big, some of the sails weigh over 150 kgs. There are over 400 ropes on each boat, there are 20 running across the keyboards. That puts me, getting my ‘downhaul’ and ‘topping lift’ sorted during twilight racing, into perspective! And these sailors might be hauling sheets in 20 knots and 4 metre seas. Richard pointed to the helm on Abu Dhabi, there is no shelter in the cockpits on the boats at all. When you’re helming you can only last an hour and half, and it’s not surprising the sailors wear helmets and face gear. Every tiny detail and every advantage is important and new technology can make a big difference in our oceans’ challenging conditions. Check out Volvo building future for technical development. The Volvo Ocean Race truly is sailing at the extreme. I look at the keel bulb (which doesn’t seem that big) and all it would take is one whale or a submerged shipping container and that’s it, it’s all over! 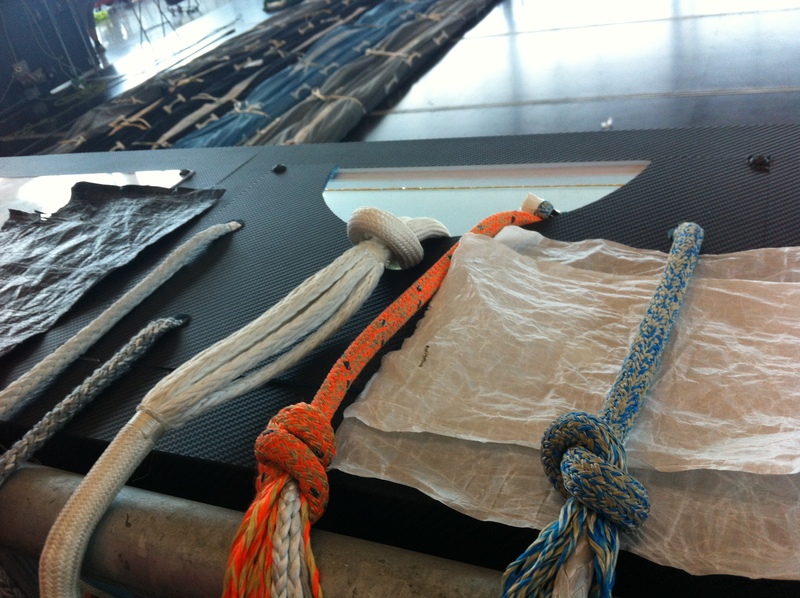 Richard quotes Bouwe Bekking (Team Brunel) who says… “You can go from ‘Penthouse to Shithouse in one tack’. I sat in the Volvo Cinema watching video footage of ABN Amro. During the race when things get serious, they get life and death serious and its reality. As Mike Sanderson said ‘It requires you to sail right on the edge of responsibility’. We’ll see them again in 2018… if they survive the ‘super cyclone’ ! Great post! Takes me right back to when we lived in New Zealand!